Who has a list in the hundreds of millions, only mails once a year, and maintains a 100% open rate? That “stat” shouldn’t surprise you. Of course kids are going to open their presents. If only people opened their emails the same way. Taking a closer look, I came up with four underlying reasons why all presents are opened and gathered ten relevant tips to help you improve the email marketing strategy for your blog. 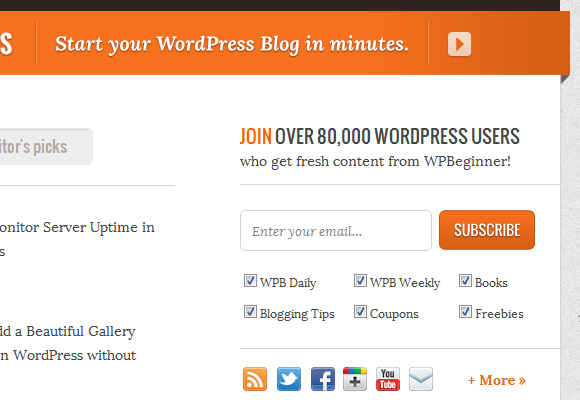 If you’re like most bloggers, you have an opt-in at the top of your sidebar. You have a couple dozen subscribers. And you consistently get a 20% open rate/8% click-through rate with emails that you send out sporadically every few weeks. This is because you’ve focused on building a list without having a strategy for once you have one. I want to help you with that. Li’l Johnny is excited on Christmas morning because he expects to find a pile of presents. More importantly, he knows that those presents contain gifts that he’s been wanting for months. 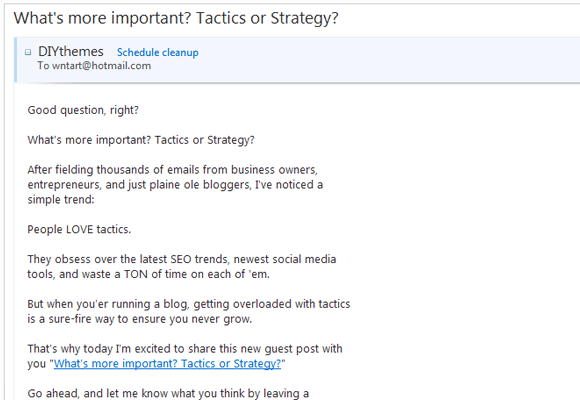 Too many bloggers trick people into opting-in with a free gift only to barrage them with unrelated emails later. I don’t know about you, but I don’t open those emails. If, however, you make it clear in your opt-in area that they’re also requesting to receive blog updates, then they’re going to expect and anticipate your emails. Sure that might discourage people from opting-in, but there’s no value in having a list full of people who don’t want your emails. 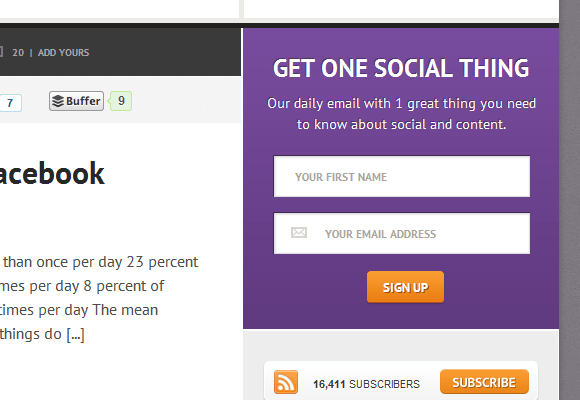 Jay Baer, from ConvinceandConvert.com, makes it clear that you’ll receive a daily email with social media advice. Once they’re receiving your emails, it’s important to remind them why they’re receiving them. Otherwise you run the risk of them unsubscribing or marking your emails as spam. 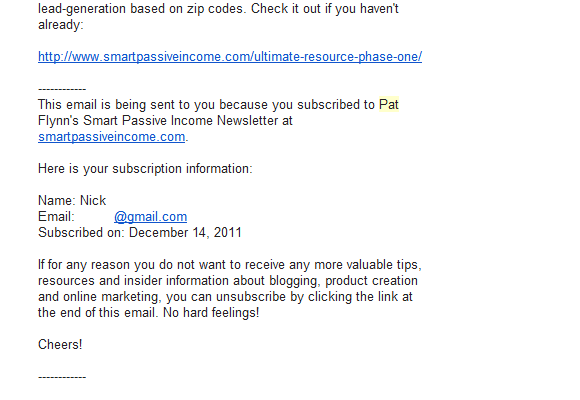 Pat Flynn, from SmartPassiveIncome.com, reminds his subscribers when and where they subscribed to his list in the footer of every email. What’s the best day and time to send an email to people around the world? I schedule the emails for 6am EST so they’re at the top of the list when people open their inbox first thing in the morning across the US. 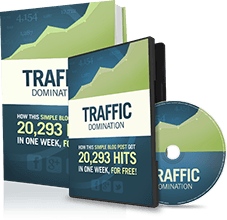 I find that posting content at 9am West Coast time is best, because it’s lunch time on the East Coast and just after work in the UK, which are the biggest markets for my traffic. All Johnny has to do to get his presents in the morning is wake up, climb down the stairs, and walk to the living room. Having opt-ins in all of the popular areas (i.e. top sidebar, bottom sidebar, top of homepage, footer of post, etc. ), is a good start. You also want to have a page on your blog that’s dedicated to getting subscribers, also known as a squeeze page. Because you and your readers can link to that page when you or they are recommending it to other people. After they fill out your opt-in form, they need to confirm their subscription. This page has one goal: Get them to open the email and confirm their subscription. Yet, few people ever optimize this small but pivotal step in the process. How do you do that? Convince them to check their email immediately. 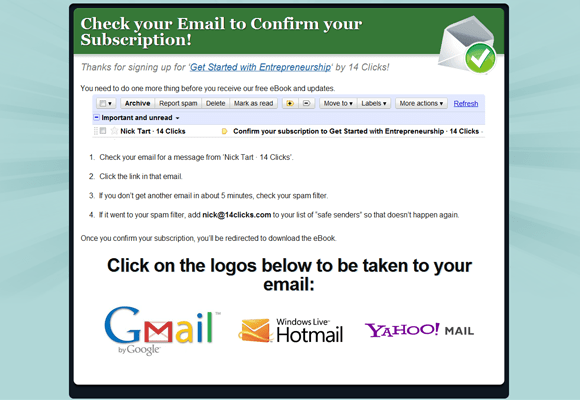 The confirm your subscription page on my blog, 14clicks.com, directs people to check their email immediately so they don’t forget. According to Litmus.com, as of April 2012, 36% of email is opened with a mobile device and that number grew 80% in the previous six months. You might fancy your 2-column, HTML email newsletters, but people who open them with their phones don’t. No more than 550-600 pixels wide. If you link somewhere, try to make sure that the webpage is mobile-friendly. The DIYthemes email is HTML-based but simple enough that it appears to be text-based so it shows up well on mobile devices. The moment Johnny unwraps a Barbie Doll, he’s going to be forever skeptical about whether or not Santa really knows him. He’ll think twice about opening the next one. Around the third or fourth Barbie Doll, he’ll stop opening them altogether. How do you personalize a mass-communication channel? Every email marketing service lets you create multiple lists. Create different lists based on the interests and activities of your audience. WPBeginner.com, gives their readers six different subscription options based on their interests. Aside from sending targeted emails based on interests, you also need to know who your audience is in order to build a personal connection with them. How do you expect me to help you? What types of content would get you to open every email? 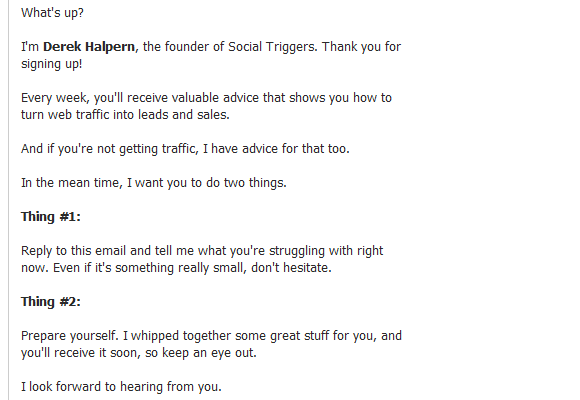 This is Derek Halpern’s Welcome Email for SocialTriggers.com. Many of his subscribers reply to this email with their #1 struggle. This let’s him meet his new subscribers and gives him a better understanding of how to help his audience. In the weeks leading up to Christmas, Johnny circles his favorite toys in the catalogs, creates a list of his favorites, and even visits Santa to tell him what’s at the top of his list. All of this to ensure that he gets exactly what he wants. What reason does somebody have to subscribe if they can get all of the same content by regularly visiting or following you on Twitter? To treat your subscribers to something special, set up an autoresponder series that gives them a comprehensive guide for information that they want. 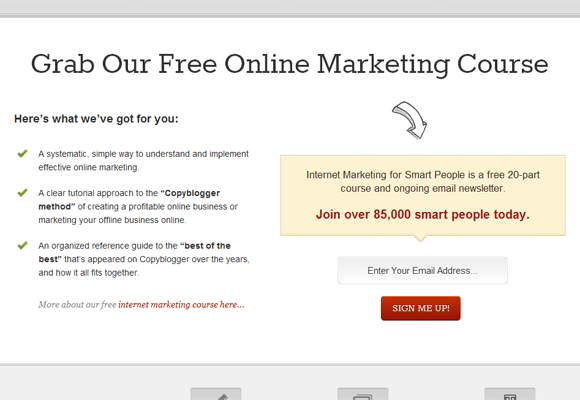 Copyblogger.com offers an exclusive, 20-part autoresponder series to their subscribers that’s based on years of researching their audience to figure out what they need help with most. I don’t know about you, but I have a tough time keeping up with reading the posts from all of my favorite blogs. To get around this, consider offering a weekly subscription option to your readers. That way they can get one email with summaries of that week’s posts and choose to read the ones that are relevant to them. You’ll also notice that WPBeginner gives people the “WPB Daily” and “WPB Weekly” options because he understands that not every post is relevant to every subscriber. Email marketing has two functions. To get to know your audience. To send people your message. Too many bloggers put too much focus on building their lists. Once they have a list, they don’t know what to do with it. So that list sits there and costs money. I hope I’ve shed some light on this all-too-common problem and given you some ideas on how to improve your email marketing strategy. If I have, let me know in the comments. As always, if you need help with implementing any of these tips, leave a comment and tell me which email marketing service you use. Great ideas! I’m going to incorporate number 5 into my strategy as that seems like something obvious that most people aren’t doing though. Thanks! I’m glad, Thomas. Are you already doing the other 9? What a great post! Adding this to my Evernote file for great things to refer back to! Well, your idea of letting people know that you’ll be including a daily or weekly email, it’ll most likely discourage them. For me, there’s no need to actually do that. The idea of email marketing is sending your message to a list where there would be a possibility where 1 out of X people catches your attention and ultimately buys your product. Yes, you’re right that most people won’t read emails they didn’t allow. But you’re missing the chance that someone might buy your product. You’re making a tactics vs. strategy argument here, Brian. Tactics-focused decisions get people from one step to the next at whatever cost (i.e. big arrow squeeze pages). Strategy-based decisions take a wholistic approach to whatever goals you’re trying to achieve (i.e. if someone isn’t going to buy, there’s no reason to get them to subscribe). If people don’t want your emails, there’s something fundamentally wrong with your email marketing strategy. It might work for awhile, but I don’t think it’s sustainable. Hi Nick, great list of tips here, i think it takes being smart and knowing your target market in and out to really segment them and offer appropriate email tips,but of course after bringing it alltogether it is a well oiled machine. I agree. What do you do to get to know your target market, Kebabope? Reminding them why they’re receiving the emails is very important. Sometimes we have so many subscriptions that we don’t know what we’re receiving anymore. Great post. Thanks, Servando. I think that brings up another point that maybe it’s important for someone to read a few of your blog posts before they subscribe so they have a chance to get to know you before they start receiving emails. Hey, your blogs are really helpful. I’m considering to bookmark it now. See, I’ve a website, but i’m not sure how to add ‘subscribe via email’. Can you help me out? And though I’ve given only genuine content in my website, still it may look spammy since I created it myself and I’m not a designer. Btw, 80% bounce rate is bad or an average for our niche? Do you have an email marketing service, Ram? (i.e. Aweber, MailChimp, etc.) And, yeah, 80% is fairly high. I appreciate it, Nahid. Why do you want a follow-up comment check box? Thanks for the tips, I will def use that on my blog as well. PS. I LOVE YOUR BLOG! Which ones are you going to use, Jason? Brilliant as always Nick. I really appreciate your tips. Oh, and by the way, I use Aweber. Me too, Houssem. 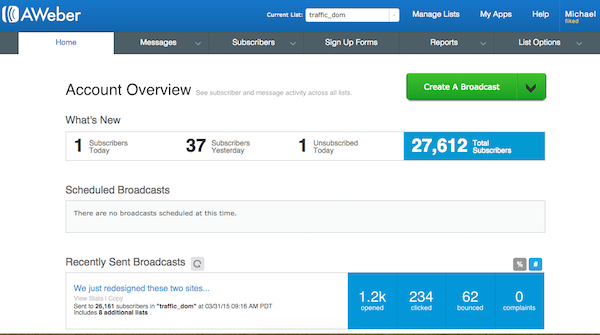 Do you use the Blog Broadcast function? Great tips, loving 3 & 6 and have saved this post for future reference. It is amazing how little effort businesses spend on tweaking their email marketing so it gets the best results. #2 and #8 are my favorites. Those are two things that very few people do. Excellent article Nick. The info you’ve presented is likely regarded as high value to anybody involved in the IM game. I especially appreciated the method of list segmentation.. Keep up the stellar work! Mailing at consistent times Noon EST works for my audience, Using your welcome email to better to get to know your subscribers great idea. and adding the exclusivity only content would help increase subscriber rate thanks!